With their visionary thinking and innovative approach to solving problems, inventors have the power to save lives, increase productivity, and change the course of history. But most inventors don’t achieve success with every creation they devise. For every telephone, Miracle Mop, or automobile, there’s an induction balance device or a car made out of soybeans. Take a look at these 11 lesser-known inventions by famous inventors. Sometime around 1500, Leonardo da Vinci invented an unusual solution to a military problem. 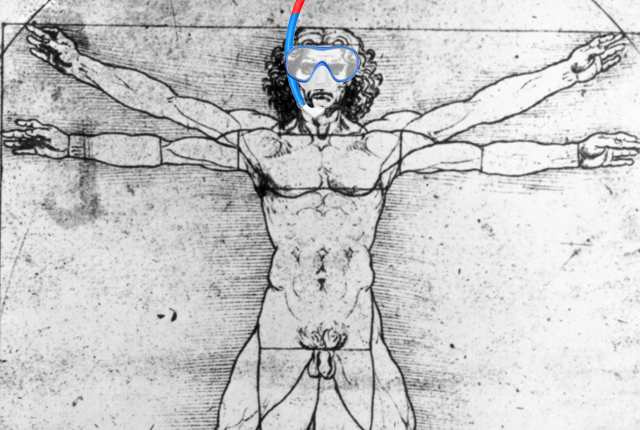 The Ottoman Empire’s naval attacks of Venice were decimating the republic, so Leonardo designed a special scuba suit that would allow members of the Venetian navy to swim underwater and sneak attack the Ottoman Empire’s ships. Made of leather, the «scuba» suit (although technically more like a diving suit) had a mask, goggles, and even a pouch to pee in. Two tubes connected to the suit allowed the diver to breathe air from above the water’s surface or from a small container of air. The Venetian navy opted against adopting the suit (seen here in all its scary-looking glory), and modern scuba diving didn’t become possible until the mid-20th century. Benjamin Franklin most famously invented bifocals, but he also dreamed up an unusual musical instrument. In 1761, while in London, Franklin heard strange sounds created as a member of the Royal Society rubbed his wet fingers around the rims of wine glasses. Inspired to make his own instrument, Franklin arranged 37 glass bowls horizontally on a rod and connected the rod to a wheel and foot pedal. Pressing the foot pedal made the bowls spin, and touching the bowls with wet fingers produced vibrations of sound. In 1762, a musician named Marianne Davies learned to play the glass armonica and went on tour, exposing audiences across Europe to its ethereal sounds. The glass armonica became so popular that Beethoven and Mozart wrote compositions for the instrument, and over 5000 glass armonicas were built. But because Franklin’s instrument was relatively quiet, it lost popularity in the 1800s as louder, amplified instruments became the norm (and the instrument itself developed a still-debated reputation for causing insanity). Beloved by TSA agents and treasure hunters alike, metal detectors play a vital role in keeping people safe and locating hidden items. While most people remember him for inventing the telephone, Alexander Graham Bell also created the first practical metal detector (probably inspired by the earlier work of Gustave Trouvé). In early July 1881, President James Garfield was slowly dying after being shot twice by Charles Guiteau. Doctors couldn’t find the bullet in Garfield’s body, so Bell got to work on a device that could find the bullet and save the president’s life. Bell called his machine—which consisted of a battery, condenser, handle, and telephone receiver to listen for clicking—an induction balance device. As Garfield became sicker, his doctor agreed to let Bell try the device on the president in late July and again in early August. Unfortunately, Bell couldn’t find the bullet—perhaps he didn’t assemble the machine properly, the bullet was buried too deep to be detected, or the president’s metal mattress coils interfered with the device—and Garfield died on September 19, 1881. Most people remember actress Hedy Lamarr for her beauty and brains. She co-invented a device that manipulated radio frequencies, making it harder for wartime enemies to jam radio-controlled torpedoes. Although she patented the device in August of 1942, hoping that the U.S. would use it to fight the Nazis, it was never used. Decades later, people realized that modern wireless technology relied on the ideas in her patent. But besides inventing an antecedent to Wi-Fi, GPS, and Bluetooth, Lamarr also invented an effervescent tablet that transformed flat water into a carbonated drink. Although the tablet worked—dissolving the tablet in the water did create fizz—the product didn’t taste good and was too similar to Alka-Seltzer. Not every invention can pave the way for Wi-Fi. After Thomas Edison invented the phonograph, he tackled his next big project: the talking doll. Patented in 1890, Edison’s talking dolls were almost 2 feet tall, had wooden limbs, and contained mini phonographs stuffed inside the children’s toys. Although not the first talking doll, Edison realized that by using the phonograph he could produce far more complicated words and phrases than the competition. Because of the technological limitations of the time, each sound recording was one-of-a-kind and featured women speaking the words to lullabies and nursery rhymes such as «Twinkle, Twinkle, Little Star» and «Jack and Jill.» To Edison’s disappointment, kids and their parents didn’t like the dolls because they were expensive, fragile, creepy, and had poor sound quality. The talking doll turned out to be one of Edison’s many failures—or, as he would phrase it, just another one of his 10,000 things that didn’t work. In the 1920s, entrepreneur Clarence Birdseye invented a method of flash freezing, packaging, and distributing seafood and other products. Although he’s known as the father of the frozen foods industry (his company Birds Eye still sells frozen veggies today), Birdseye also invented a mechanical harpoon gun to tag whales. Interested in learning more about fish and marine mammals, he built and patented a contraption to mark whales. Made of aluminum and rubber, the handheld harpoon didn’t recoil after shooting, providing a more pleasant tagging experience. Although Birdseye used his harpoon to tag dozens of finback whales, his invention was more for personal enjoyment than commercial use—or at least that’s the official story. Some have accused Birdseye of using his device for whaling. As an 11-year-old, Franklin loved swimming and wanted to swim faster. To increase his aquatic speed, he decided to wear a pair of wooden paddles around his wrists. Using round planks of wood, Franklin drilled holes to fit his thumbs through and grip the planks. Although the paddles helped him swim faster, the extra weight made his wrists tired. Franklin obviously moved on to bigger and better things, but his lifelong support of swimming as a healthy activity earned him an honorary spot in the International Swimming Hall of Fame. Best known for inventing the Miracle Mop (Jennifer Lawrence portrayed her in the 2015 movie Joy), Joy Mangano also invented a type of elevated shoe. Called Performance Platforms, the sneakers have a rubber platform heel with Get Fit (TM) technology that can tone a wearer’s hamstrings, quadriceps, and calves. Launched in 2010, the platform shoes claim to help users multitask by firming their muscles while they go about their daily business. Not bad for a sneaker. Although most famous for producing a better light bulb, Edison also invented an early form of vacuum-sealed packaging. But rather than focus on preserving meat, Edison and the inventors he worked with concentrated on fruit. In October 1881, he patented his method to preserve fruit, which involved putting a fruit or vegetable into a glass vessel, pumping the air out, and sealing the vessel with heat. To read Edison’s own words about the science behind the process (and check out his elaborate diagram of the contraption), take a look at his patent [PDF]. In 1934, the inventors George Washington Carver and Henry Ford became pen pals, exchanging information and sharing their knowledge about agriculture and automobiles, respectively. Hoping to discover an alternative source of fuel to replace gasoline, Ford investigated the properties of peanuts and other crops with which Carver worked. In 1937, Carver visited Ford in Michigan so the two inventors could experiment with crops together. Ford’s interest in chemurgy (making industrial products from agricultural products) culminated in a soybean car, a lightweight automobile made with plastic derived from a soybean mixture (and possibly other plants like hemp, flax and wheat—the formula was lost). In 1941, Ford debuted the soybean car at a summer festival in Michigan, but the vehicle never caught on. Leonardo’s artistic skills came in handy when he sketched intricate diagrams of his ideas for inventions, which ranged from a more accurate clock to a flying machine. But he also sketched an invention for a self-propelled cart and a suit of armor that could sit down and wave its arms. Although Leonardo may have never built his robotic knight suit, his drawings of it indicate that a system of gears, wheels, and cables would allow the coat of arms to open its mouth, wave its arms, sit down, and stand up on its own. Scholars speculate that he devised the robotic knight as a way for monarchs to entertain and impress guests in their royal courts.